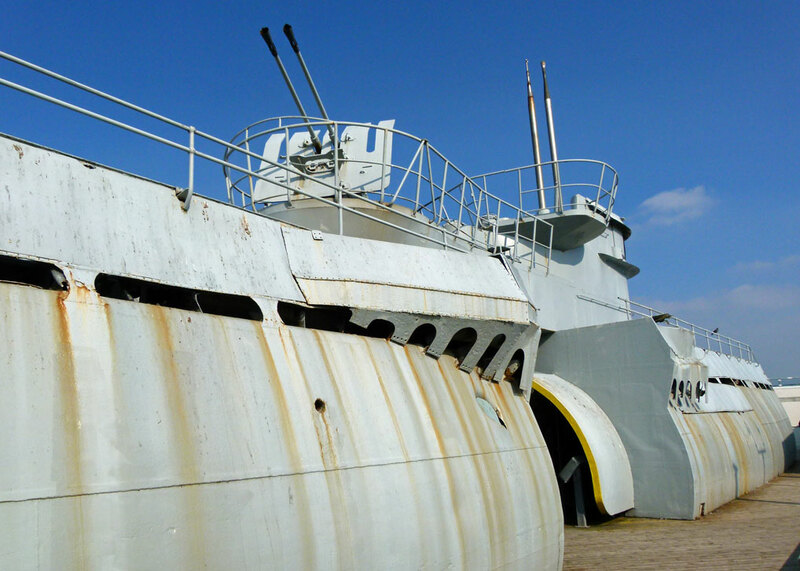 The sectioned remains of a World War Two vintage German submarine, or U-boat (from Unterseeboot – undersea boat), lie next to Woodside ferry terminal at Birkenhead, on the west bank of the River Mersey. In April 1945, Hitler’s Third Reich was dying. The Allied armies were inexorably closing in, like the jaws of a giant pair of pincers: Russians from the east; Americans, British, Canadians, French and Poles from the west. On 29 April, German forces in Italy and Austria surrendered. On 30 April, in Berlin, as Soviet troops moved ever closer, the Führer and his new wife, Eva Braun, committed suicide in their underground bunker. The next day, 1 May, U-534 of the Kreigsmarine, under the command of Kapitänleutnant Herbert Nollau, slipped unobtrusively from its pen in Kiel harbour and quietly out into the cold Baltic Sea. She arrived in Copenhagen the following day, the same day that Berlin capitulated. On 4 May, German forces in North West Germany, Denmark, the Netherlands and Bavaria surrendered. Also on 4 May, Großadmiral Karl Dönitz, Hitler’s nominated successor, ordered all U-boats to cease offensive operations and return to their bases. On 5 May, U-534 either left Copenhagen or was already at sea. On 6 May, Dönitz approved the unconditional surrender of all German forces in all theatres. His representative, Generaloberst Alfred Jodl, put his signature to the surrender in Reims at 0141 hours on 7 May; a further signing took place at 2330 hours in Berlin the same day, witnessed by representatives from Britain, the USA, USSR and France. The war in Europe was over; 8 May was declared Victory in Europe (VE) Day. However, not everybody stopped fighting. Wars aren’t like that. Certainty is unreliable; things are not necessarily clear-cut. For one thing, contrary to caricature, it is possible that not every German obeyed their orders. Between 1 and 8 May 1945, for example, 214 U-boats were scuttled by their crews, rather than suffering the dishonour of having them fall into Allied hands. Indeed, Dönitz initially ordered scuttling, subject to confirmation by the code word regenbogen (rainbow), before being forced by the Allies to issue his instruction of 4 May. And contrary to that, in Scotland’s Firth of Forth just after 2300 hours on 7 May – that is after Germany’s surrender – U-2336 sank two merchant ships, one Norwegian and one Canadian. This was by no means the only U-boat attack since Dönitz had ordered the cessation of operations, though it was the last of the war. By that time, however, U-534 was herself already at the bottom of the Kattegat, just off the Danish island of Anholt. She was sunk at 1243 hours on 5 May by depth charges dropped from an RAF Liberator, which punctured the hull near her propellers. And so we come to the mystery, or possibly myth, of U-534; the craft’s unknown mission before it was so rudely interrupted by the Royal Air Force. Where was she going – and why? Much has been made of this. U-534 was, allegedly, the last U-boat to leave Germany while, all around, Allied armies were mopping up the doomed Nazi regime. On the face of it, given that the war was pretty much over, it might seem a little odd that a German submarine should sail from the Fatherland unless there was some very good reason for it to do so. Did it have a secret assignment? Was it carrying looted gold bullion, or have a rendezvous to collect and convey a top Nazi to safety in South America? Were the crew themselves simply trying to evade capture? The puzzle is not helped by the chaotic situation that prevailed at the time, the fog of conflicting dates and accounts in various secondary sources, including several websites happy to hint at conspiracy theories, and the fact that everyone likes a good whodunit. There is the matter of Dönitz’s order to cease operations and return to base. Did Kapitänleutnant Nollau not receive this order, perhaps because he was out of radio contact; or did he ignore it? Then there’s the manner of U-534’s sinking; if the RAF knew that enemy submarines were to due to return to base, or about to surrender, why would they attack? Specific orders were issued that U-boats should fly a black or dark blue flag signifying their surrender, but whether this had been broadcast by 5 May is not clear. U-534’s service career had been spent mainly in a training capacity and on weather reporting duties off Greenland. She never sank anything, but had been in action several times, on one occasion shooting down an RAF Wellington bomber. On the 5 May 1945, she was heading north through the Kattegat toward Norway, away from Germany, in the company of two other submarines, both the latest XXI type, U-3503 and U-3523. Most accounts I have seen suggest that the three submarines came together unexpectedly and decided to proceed in convoy, but that’s by no means certain – and some accounts don’t mention the other two submarines at all. In late morning, the small flotilla came under attack by two B-24 Liberators of RAF Coastal Command. The first aircraft, of 547 Squadron based at Leuchars, was shot down – either by all three submarines acting in concert, or by U-534 alone. Five of the aircraft’s six crew were lost. U-3503 and U-3523 then dived. On its second run, strafing the deck with machine-guns before dropping its depth-charges, Liberator G–George of 86 Squadron based at Tain, scored a direct hit on U-534. Forty-seven of the fifty-two crew managed to escape before the U-boat went down. Five were trapped in the forward torpedo room, but, incredibly, freed themselves through the tubes once the submarine had settled, though one man died on the way to the surface and two, including, apparently, a radio operator who had been born in Argentina, either drowned or died of exposure. All the remaining crew, and the surviving RAF airman, were rescued. The following evening, 6 May, U-3523 was sunk with the loss of all fifty-eight hands, coincidentally by the same RAF Liberator, G-George, albeit with a different crew. U-3503 was scuttled by her crew in Swedish waters on 8 May. The wreck of U-534 was discovered by a Danish wreck hunter, Aage Jensen, in 1986. Speculation and rumours about her mission and what treasure she might contain created considerable media interest and, in 1993, almost half a century after she had been sent to the bottom of the sea, a Dutch salvage company raised her to the surface. But no gold was found, no looted artwork, no trace of any missing Nazi war criminal. They did find tons of explosives, including 13 torpedoes, fascinating documents, two Enigma cipher machines and personal effects including Bibles, song-books, cameras, cigars, cigarettes and chess sets. In short, U-534 was a time capsule. The press made a big thing of wine and condoms being discovered on board, but the Sharkhunters’ website, dedicated to the history of U-boats, suggests the condoms were actually balloons used to foil enemy radar. Could they have been weather balloons? I don’t know. 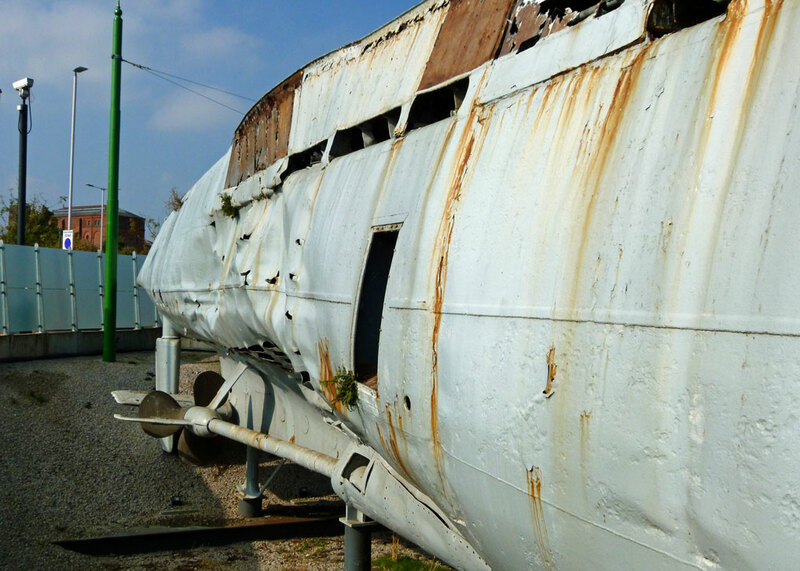 U-534 was transported to Birkenhead in 1996, to form part of a, sadly, now-defunct warship museum. 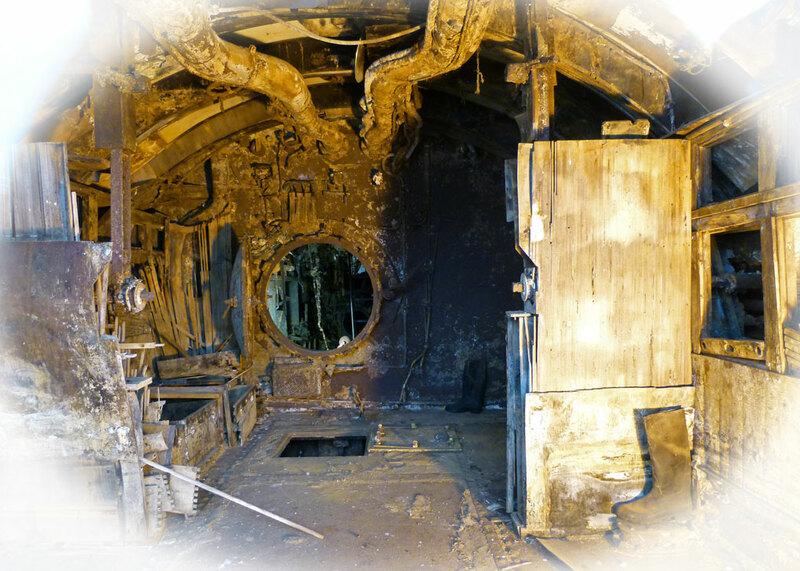 The submarine was eventually acquired by Mersey Travel, which had her cut into sections for ease of transport to Woodside ferry terminal, and where you can now inspect her alongside a fascinating museum, the U-boat Story. It’s a highly appropriate location, since Liverpool was both destination and departure port for convoys during the Second World War, the very convoys that were targeted by U-boats like U-534. The headquarters for Combined Operations Western Approaches, which coordinated British forces during the Battle of the Atlantic, was based there; this too is now a museum. Viewing U-534 is a curious experience. 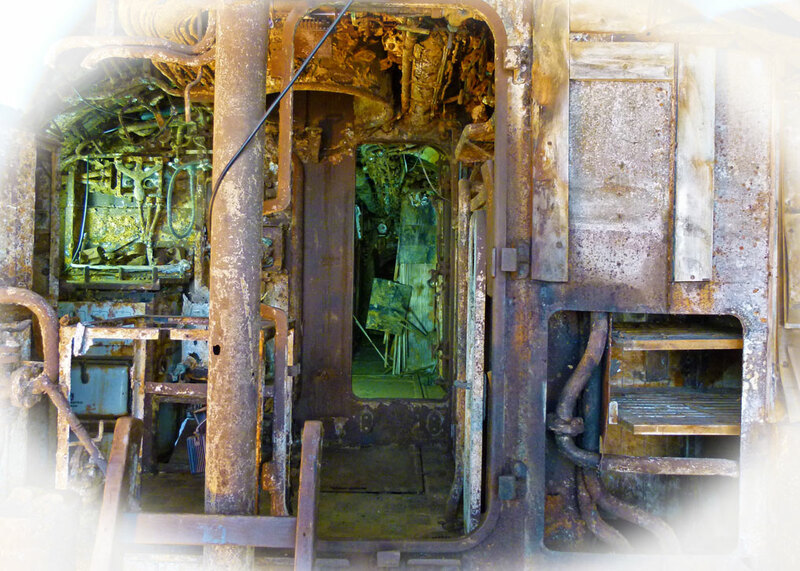 Life aboard any submarine of that period was pretty basic and, frankly, the interior looks like a tomb filled with rusting obstacles of obscure purpose. I could not help thinking of the men of all nations whose last moments passed in vessels like this, in war and peace, at the silent bottom of some ocean, far from help, friends and loved ones. 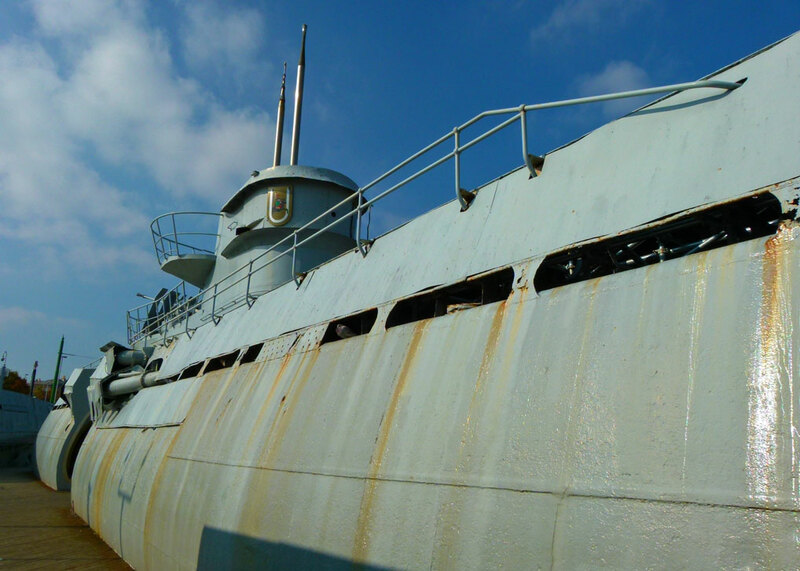 The exterior of U-534, despite being sectioned, is undeniably menacing, like a giant monster – though no doubt that view has much to do with a vivid imagination and an unhealthy interest in military history. The prospect of going to war in a submarine is terrifying, but it was hard to suppress a frisson of excitement, looking at this brooding grey creature of the deep. Germany commissioned at least 1,150 U-boats in the period of the Second World War – some sources say it was as high as 1,250. Hunting individually and in groups known as wolf packs, they wreaked terrible and indiscriminate havoc on Allied lives, shipping and material, threatening the very existence of the United Kingdom. Churchill later said, “The only thing that ever really frightened me during the war was the U-boat peril.” Yet, U-boat crews themselves had a hideously high casualty-rate of 75%. According to the fascinating and incredible website u-boat.net – an invaluable resource for all you U-boat enthusiasts out there – between 1939 and 1945, Germany lost 767 U-boats to enemy action or other causes; 238 were scuttled (of which 216 had been commissioned) and, between 5 and 19 May 1945, 156 surrendered – a total of 1,161 boats. Most of the those that surrendered were subsequently sunk – surely, a shocking waste of resources to our modern eyes. There are just three more surviving U-boats from World War Two, in addition to U-534: U-505 is in Chicago’s Museum of Science and Industry; U-995, following a second career with the Norwegian Navy, is now part of the Naval Memorial at Laboe, Germany; and U-2540 is also a museum ship in Germany, in Bremerhaven. 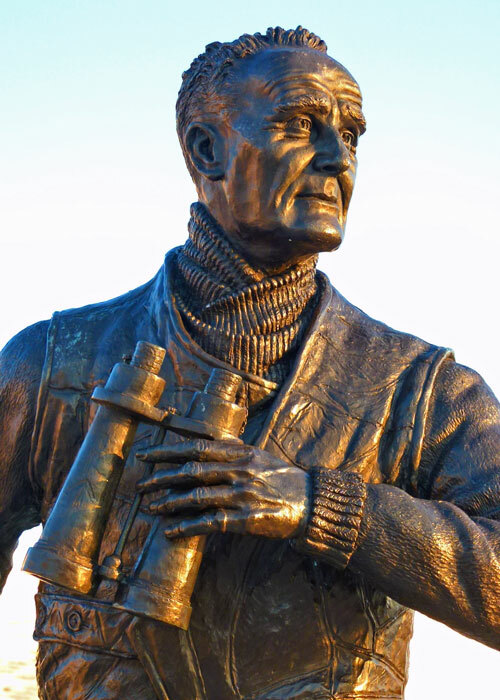 Incidentally, on the Liverpool side of the Mersey, close to the ferry terminal, is a statue to Captain ‘Johnnie’ Walker, the Royal Navy’s most successful submarine hunter of the war, who used to order the tune ‘A-Hunting We Will Go’ to blast from the loudspeakers of his ship, HMS Starling. So – what’s the answer to the mystery of the U-534, then? Well, without spending even longer on research than I already have, it seems to me quite likely that the mystery is exaggerated. It has been suggested that it might be odd for a German submarine to be leaving port when it did; but many U-boats did exactly that. To give one example, U-977 sailed on a combat patrol on 2 May, and was at sea off Norway when Germany surrendered; her captain put ashore any crew members that wanted to be released, and then decided to sail to Argentina. We do not know U-534’s destination, but there is a suggestion that she, along with other boats, had been ordered to sail to Oslo to surrender – possibly as a bargaining chip with the western Allies. I have seen an account purporting to be from U-534’s first officer, Wilhelm Brinkmann, who claims exactly that – and that the wine on board, which would normally be banned, was because the crew was determined to have a good time before giving themselves up. He denies knowledge of any condoms. There has been speculation that the attack on U-534 on 5 May was in some way exceptional. But it was not; irrespective of any order issued by Dönitz, the war was still on, U-boats were still operational, often taking decisions unilaterally in a confused fog of perhaps conflicting orders and feelings, and Allied aircraft were still attacking them – six U-boats were destroyed at sea on 5 May alone, including U-534. Some accounts suggest that the drowned wireless operator was Argentinean, rather than simply being born there, and that this is somehow significant. What is true is that U-534 was a type IXC/40 submarine designed to operate far from her home base, with a range of about 13,800 nautical miles – so assuming it was fully provisioned, it could have reached South America easily – or perhaps even Japan, Germany’s ally, which was still fighting hard. Which brings us to one thing about U-534 that might be exceptional. 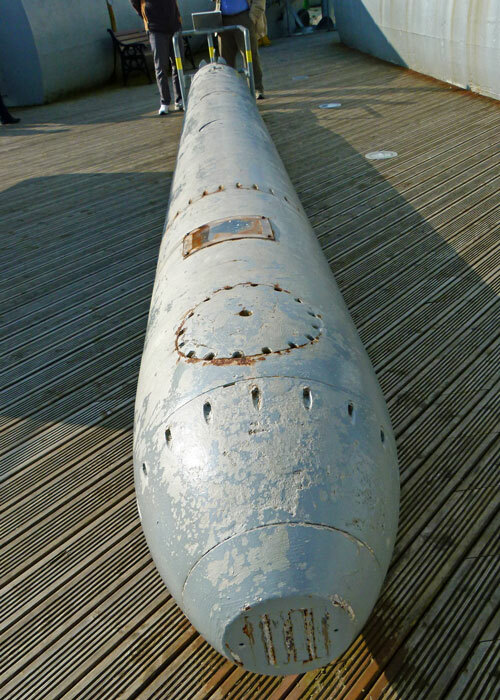 Among the 13 torpedoes U-534 was found to be carrying when she was salvaged, 3 were the latest T11 Zaunkönig 2s, the most advanced weapon of its type at the time. Only 38 of these were ever built, at a cost of 400,000 reichsmarks each in 1945. This was a highly sophisticated acoustic torpedo with an electronic sonic guidance system designed to track targets by the sounds of their propellers, filtering out the distracting noise made by decoy systems deployed by the Allies. Was Kapitänleutnant Nollau planning to bargain with these somewhere, or even make some extra cash by selling them? In Norway, perhaps? Or further afield; was he taking them to Japan? Nollau, just short of his 29th birthday when his boat went down, never said a thing. He was briefly held as a POW, later worked for the German Postal Service and committed suicide in 1968. So whoever wants to know the truth about U-534 will need to do a lot more digging. The biggest mystery might actually be how the boat ended up in England; presumably, once it was discovered it contained no obvious treasure, it went to whoever paid the highest price for it. But, however it happened, it means you can visit her in Birkenhead, including as part of a trip on the famous ferry across the Mersey. For reference folks, my father was the wireless operator on G-George that sunk U534. I even have his flight log book with the details of the sinking. I have search for years to actually find the Liberator that dunk U534 but have hit dead ends. I had never heard that story. I have been in three submarines – safely on land, no U-boats. The thought of going in one at war is terrifying, but don’t we all love a submarine film – from John Mills, in that film where they know they are going to die ( must have watched with my mother on tv at least once a year ) to Das Boot, surely the best evocation. An intriguing mystery. I can’t imagine spending time on a submarine, very claustrophobic. In depth post- no pun intended. Watched a recent programme about average battlefield statistics during the war towards the end as the tide started turning against Hitler. Seemingly Western Allies accounted for roughly 20 percent of all German troop casualties. Russia and the Russian winter nearer to 80 percent German fatalities in that same time period so it could have been a very different outcome if Stalin had refused to get involved. Something that’s rarely mentioned in the west where ‘we’ won the war is the general message. I think I would have owned up to that pun, intended or not; but I have no shame. Yes, I can believe it. You could argue for two decisive factors in winning WW2 in the time and manner in which it happened: 1) US economic and industrial power; 2) Soviet human resources – no one, except possibly the Chinese, could have suffered as many casualties – c25 million dead. A third factor might have been British intelligence. You’re right, we don’t hear enough about Russia’s great patriotic war – but then they probably ignore our contribution too! Stalin probably had little choice in whether to get involved after Hitler invaded. Max Hastings says some fascinating things about the ‘kill-rates’ of various nations armed forces in ‘Operation Overlord’ if you’re interested. Thanks! I’m a bit of a history nerd, so I really enjoyed this. Interesting stuff. 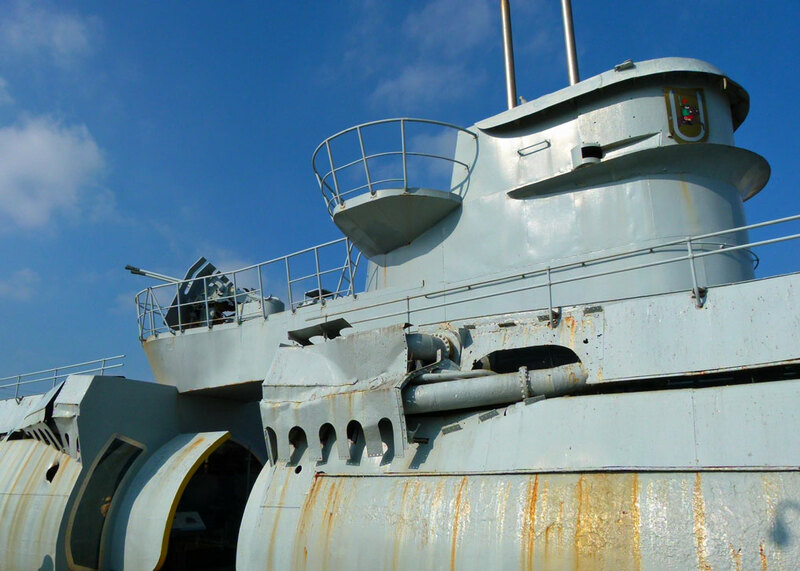 Not long ago, I wrote a post about a U-boat that was doomed by its own toilet. Thank you – not flushed with success, then? Fascinating. Love the statue photo, glad he is honored. It seems that once speculation starts, it can go wild. We love a mystery, so I understand why this one continued to grow and become a tangle of fact and fiction. Full speed ahead and damned the truth. (Small play on old movie dialog. Sorry.) Very interesting information and something I knew nothing about. I guess the treasure was really the sale of the boat by Jensen. I love history, so this was a very interesting read today…again. Thanks. Thanks for another excellent history lesson. A fascinating history! I’d like to see it. Years ago Jack Higgins wrote Thunder Point, which started with a U-boat going down in the Caribbean in the days after the war ended, carrying a briefcase filled with secret documents, and having had taken Martin Bormann away from Germany. Sounds like a ‘cracking good read’! I used to enjoy Jack Higgins’ novels. Though I think they’re pretty sure Bormann perished in Berlin now, aren’t they? We saw this when we visited Liverpool last fall. I was saddened by the fact that they lost their lives unnecessarily as the war was already over. Thanks for shedding light on the situation. An excellent post. Wonderful post, Mike. In attempting the unravelling of this episode in the dying stages of the war, you have excelled even yourself in research. You have distinguished between myth and reality. And added to my own knowledge – thank you. I always enjoy a submarine story, Mike! In September, 1944, operating in a Wolf Pack, she and her sisters sank most of a Japanese convoy. Three days later, Pampanito, having circled back to the same site to await another convoy, discovered survivors of the previous convoy in the water. They were British and ANZAC POWs – the same who had built the Burma Road (Bridge Over the River Kwai) – being transported to Japan to work as slaves in the Japanese copper mines. Pampanito and other subs in the wolf pack rescued some of these POWS. This was so interesting, Mike! I do love a mystery! It would be a miracle if we ever found out what Nollau was really doing. My money would be on something quite innocent!